The Omega Constellation Grand Luxe is something really special. Omega introduced the Constellation in 1952, being more or less the successor of the Centenary watch that Omega introduced in 1948 to celebrate the 100th anniversary of the Biel watch factory. Already being the flagship of the Omega manufacture [because of the fine finish and chronometer movements], the Constellation came in several grades in the 1950s. The ultimate edition was the Constellation Grand Luxe, even one step above the Constellation Deluxe, available in all gold or platinum and with the famous brick bracelet. For those of you not very familiar with the vintage Constellation series: the brick bracelet was reintroduced by Omega in 1999, when they announced their new co-axial movement in the Omega DeVille Co-Axial during BaselWorld 1999. Meertz’s World of Time in Munich has a Constellation Grand Luxe for sale from the 8th of April 1957, complete with box and papers. The watch was originally bought in Wiesbaden, near Frankfurt in Germany. It was a really expensive watch in the 1950s, probably as expensive (or even more) as the Rolex Oyster Perpetual Day-Date in those days. This ref. 2930 SC Omega Constellation Grand Luxe has a superb in-house movement caliber 505 and a massive gold pie pan dial with diamond shaped markers. 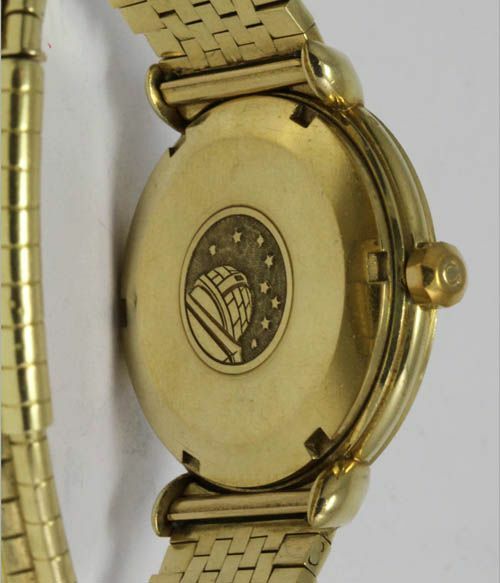 The back side of the watch has the famous observatory logo with a group of stars (Constellation = a group of stars whose movement through the celestial vault is consistent and predictable). Also, the ten-sided crown of this watch is still there. 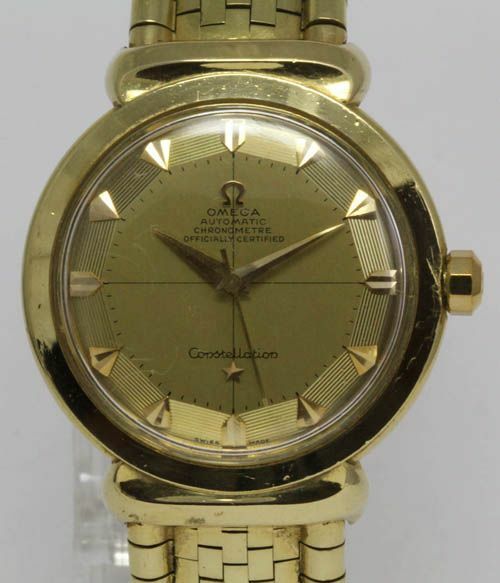 I am note sure whether Omega will replace it with a similar crown during a service, but I’ve seen jewelers using ‘generic’ gold Omega crowns to replace these beauties. Meertz in Munich asks 9.800,- EUR for this beautiful Constellation Grand Luxe 2930 SC, complete with box and papers. Comes with a 1 year warranty and 14 days right-of-return term. 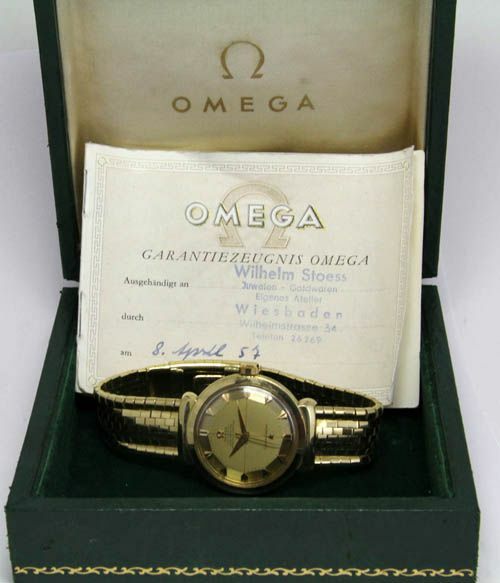 More information about the Omega Constellation line-up can be found at omegamuseum.com/constellation. Also check our Facebook page for the pictures we took of the Constellations during our Omega Museum visit. Thanks to our reader Jtk for some corrections!